Today Google launches Ancient Rome 3D on Google Earth, making it easy and fun to explore the historic city as it stood centuries ago. View a virtual representation of the city in 320 AD at the height of its development as the capital of the Roman Empire. Fly around the city using Google Earth’s unique navigation. Explore more than 6700 historic buildings. Zoom in to discover the detailed interiors of eleven ancient structures including the Colosseum. Learn about Ancient Rome through information bubbles written by expert historians. Ancient Rome 3D is one of the most extensive collections of three-dimensional buildings – and the first ancient city – to be found on Google Earth. 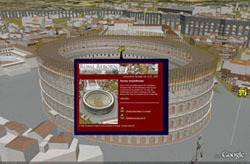 Within the Ancient Rome 3D layer users can visit the Roman Forum, stand in the centre of the Colosseum, trace the footsteps of the gladiators in the Ludus Magnus, stand on the Rostra, swoop over the Basilica Julia, fly under The Arch of Constantine or even examine the detail on the facade of the Basilica of Maxentius. To celebrate the educational possibilities for this layer, Google is sponsoring a curriculum contest for K-12 educators in the United States. Teachers in all subject areas are encouraged to submit creative, innovative lesson plans that incorporate the Ancient Rome 3D layer. For more information and contest rules please visit earth.google.com/romecontest. The project has been developed by Google in collaboration with Past Perfect Productions and the University of California, Los Angeles and the Institute for Advanced Technology in the Humanities (IATH) at the University of Virginia. To download Google Earth and learn more about the layer, users can visit earth.google.com/rome/. 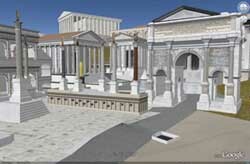 To view Ancient Rome 3D, users should go to the "Layers" panel of Google Earth, select "Gallery," then "Ancient Rome 3D." Visit the Official Google Blog for a message from the Mayor of Rome and the Lat Long Blog for more information.